It would be accurate to state that there is more to do in operating a restaurant kitchen than most any chef can effectively deal with. Writing menus, testing recipes, ordering product, connecting with farmers and vendors, hiring, training and evaluating staff, maintaining standards of sanitation and safety, monitoring production and filling in wherever needed equates to more hours than there are in a day. Yet, if the chef is not in tune with and very knowledgeable about wine, beer, distilled beverages, service, marketing, cost control and image building then their job is incomplete. The food is absolutely important, but it is only one part of the formula for a great meal. In this article I will only touch on one of those components: wine. There are three ways to view a wine list in your restaurant: the menu drives the complementary wines you want to sell, the wine drives the type of menu you want to offer, or, the wine list is independent without real thought given to how it fits. Obviously, the first two options would be preferred, providing there are certain menu list parameters that are always considered. The chef must be actively involved in the selection of wines that will add interest and depth to the menu being developed. To be able to do this, the chef needs a breadth of knowledge, a competent palate and the resources necessary to make an intelligent decision with wine purchases. This cannot be a front of the house decision alone, the wine footprint for your restaurant helps to build your restaurant signature and as such is part of the culinary focus. The chef needs to understand the source for wines (country, region, vineyard, grape and terroir) just as he or she must know the source of ingredients used in building the food menu. The quality of the grape, climate, make up of the soil, and topography are just as important, if not more, than the expertise of the wine maker. Just as a cook is trained to taste – season – taste, so too must a chef learn to sip, swish and drink wine with the foods that it will most likely accompany. It is the chef’s palate that drives a menu even after consideration for guest preferences. Each restaurant chef must know the wine list at a similar level to the food menu. What are the characteristics of a cabernet sauvignon vs. a merlot or zinfandel. When is a French Chardonnay preferred over one from Northern California. Why are Pinot Noirs from Oregon recognized as comparable to those from France and wines made from the same grape in other parts of the United States not so lucky? What makes a particular vintage so spectacular and another so-so? When are tannins a good thing and when are they not? A chef’s food palate may take decades to fully develop, so it may take some time to build a similar palate for wine, but professionals cannot defer on this important task. When the guest arrives they are in your hands. The chef can sculpt a guest experience providing his or her breadth of knowledge goes beyond the flavor profile of that braised veal shank. The chef may never have the scope of wine understanding of a sommelier, but he or she must be able to talk the language and stand up to decisions regarding what will be sold as an appropriate food pairing. Collaborative sessions leading to wine dinners, designation of new wine by the glass candidates and tasting sessions with clients for group events are all integral parts of a chefs job. A reasonably expansive wine inventory in a restaurant can easily be valued in the hundreds of thousands of dollars. Though some may be inclined to collect wine and speculate on it’s eventual inflated value, most restaurants hope to turn their wine inventory over every six to nine months. This goal requires that the chef and wine manager work together in an effort to find ways to attract enthusiasts and build complementary wine sales. Neither the front nor back of the house will reach their sales goals without collaborative understanding and marketing efforts. 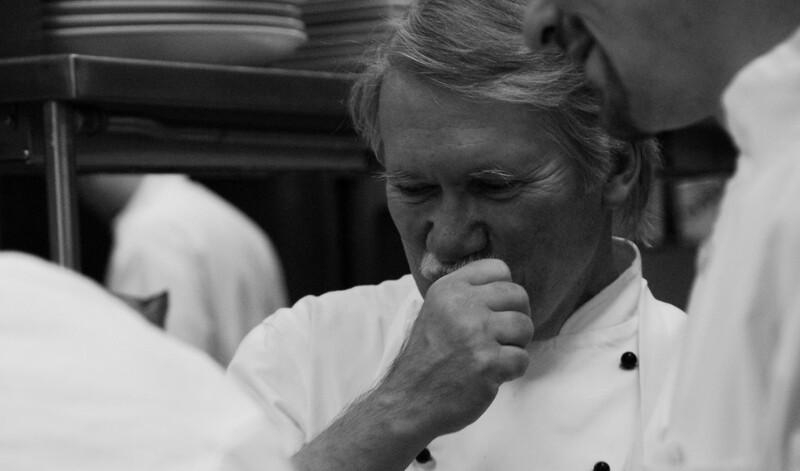 There are certainly great examples of chefs who have taken this task to heart. Thomas Keller, Alice Waters, Mario Batali, Alain Ducasse and Daniel Boulud have sophisticated wine palates and their wine lists demonstrate this love and understanding. But, this appreciation for, and knowledge of wine should not be limited to the relatively small percentage of high-end restaurants with celebrity names behind the range. When one considers that alcoholic beverages still account for the most profitable items on a restaurant menu it behooves chefs in every full service restaurant to build a repertoire of wine knowledge and create lists that work with food in a complementary way. Wine consumption has grown steadily over the past few decades as consumers built an appreciation for quality and became more adventurous. Even with this substantial growth, wine consumption in America pales in comparison to Europe (although wine is losing some of its attraction to younger European consumers). This demonstrates a significant opportunity in our country to build on a fresh interest in wine and its ability to balance well with food. Knowledge is power for a chef and wine should be a part of that knowledge base. For those interested, here are a few examples of great references that can help with developing a solid wine knowledge for chefs.